We experience our own lives as single uninterrupted thread. We're the same person from the time we begin to understand our own identity until we die. This is, of course, nonsense. From the perspective of those who know us, we may be several very different people, depending on where we are at any given point; young and hungry, mature and respectable, old and decrepit, cunning or honest, dependable or dodgy. Where you catch us makes us who we are to you. We're all a collection of personalities. 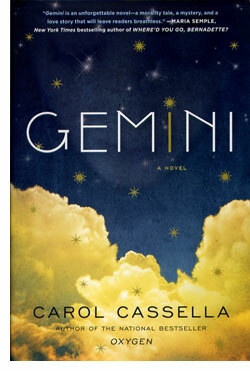 Carol Cassella's 'Gemini' is a quiet, engaging, and tense look at who we are, how we become that way and what changes us from one sort of person into another, with an eye towards the biology of human beings. It's told, with one important exception from the perspectives of two very different women. Charlotte Reese is working intensive care in Seattle's Beacon Hospital. Jane Doe arrives unconscious and unlikely to be revived. Who was she and how did she get that way? Raney Remington is a teenager growing up under her grandfather's care on the Olympic Peninsula. What do these stories have to do with one another? How will their paths cross? It's a setup that naturally induces a tension that Cassella maintains until the last page. Cassella invests time in her characters, and manages to craft deeply affecting people who fee; quite real. It's a small cast; Raney, her boyfriend of sorts Bo, her grandfather, Charlotte, her boyfriend, Eric, and Jane Doe. And Cassella keeps everything admirably low-key. There are no world-changers here, no super-heroes or even conventional heroes. The men-and-women next door who people this book have small hopes, almost realized and their scale makes them seem very textured, very real. They become your neighbors. While the plot seems at first as if it might be rather simple, Cassella's complicated characters give it a depth and lend a real heart-rending tension to matters. Much revolves at a very low and relatable level, around medical matters. Jane Doe's condition puts her in a legal limbo that ratchets up the suspense nicely. Cassella's vision of the healthcare system makes a lot of quietly powerful statements without ever seeming polemic. She simply shows the goods and tallies the costs. It adds up and not in the favor of the people involved, or the system itself. Underlying all this is a crisp, clean prose style that's admirably transparent when it needs to be but is also willing and capable of capturing the poetry of people and place. 'Gemini' has some real surprises in store for readers that will inspire a nicely understated sense-of-wonder and some introspection on the nature of identity. Cassella's writing is poignant, powerful and yet at the end of the day, simply real. Here is the dualism of the world, of who we were and who we are. Every night we fall asleep, and a different person wakes up in the morning. 'Gemini' plays with fictions and facts. Both are stories, not unlike the story we tell ourselves, the story that answers the question: Who am I?